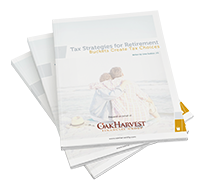 Your Oak Harvest Retirement Plan is a customized solution aimed squarely at your retirement needs. No two plans are exactly alike. We tailor investments, income, tax-reduction, safety, long-term care and legacy solutions around your retirement vision and goals. Instead of trying to fit you into a box, Oak Harvest builds the box around you. It starts with a discussion about your retirement vision. A retirement vision is the most critical element of a customized retirement plan because it allows us to clearly identify specific goals, allowing our team to get to the root of what is important to you. Once those goals are identified, we explore and educate you on the strategies that can make your vision your reality. When the appropriate strategies are agreed upon, it’s time to discuss which tools are appropriate to complete the plan. Stocks, bonds, CDs, annuities and mutual funds are nothing more than financial tools that can be used inside your Oak Harvest Retirement Plan to accomplish your vision and goals. As independent fiduciaries, we don’t care which tools are used. We care only that the best tools to accomplish the job are implemented. You will have in front of you a simple, easy-to-understand Retirement Income Plan. You will have an investment strategy appropriately fitting your investment objectives and risk profile. You will have a Social Security strategy that’s designed to maximize your life savings, not just your Social Security benefits. You will have a long-term care strategy that’s designed to maximize and protect your retirement against future medical costs. Your legacy desires will be addressed by a CERTIFIED FINANICAL PLANNER™ professional who coordinates and works with attorneys who draft the appropriate legal tools, if needed. Once complete, your Oak Harvest Retirement Plan flows into a monitoring process where adjustments can be made when the investment, tax or legal landscape change. It’s reviewed frequently with you by your dedicated team, which includes your advisor, the investment team, and our services team.